In this section, you will be introduced to the quick outline view. Quick views are in-place views which are shown on top of the editor area and can easily be controlled using the keyboard. A second quick view will be introduced in the Type Hierarchy section. 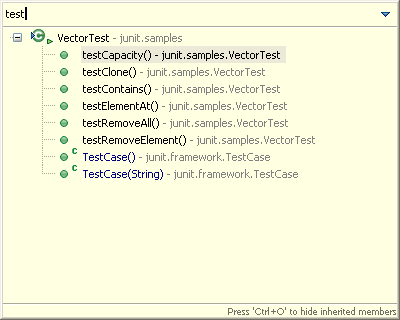 Open junit.samples.VectorTest.java file in the Java editor if you do not already have it open. Press Ctrl+O or select Navigate > Quick Outline and you will see an in-place outline of the current source file. 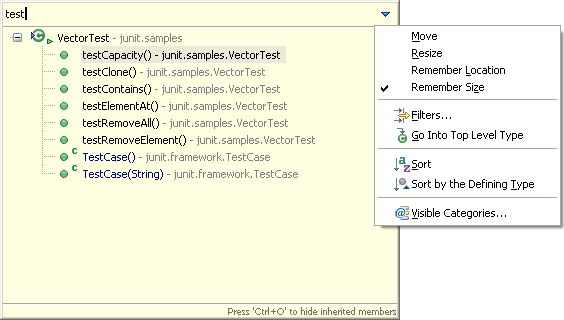 Press Ctrl+O a second time and all inherited fields, types and methods are shown as well (for the types marked with on the left). Inherited members are shown in blue. Start typing while the quick outline view is shown to filter the list of displayed elements. 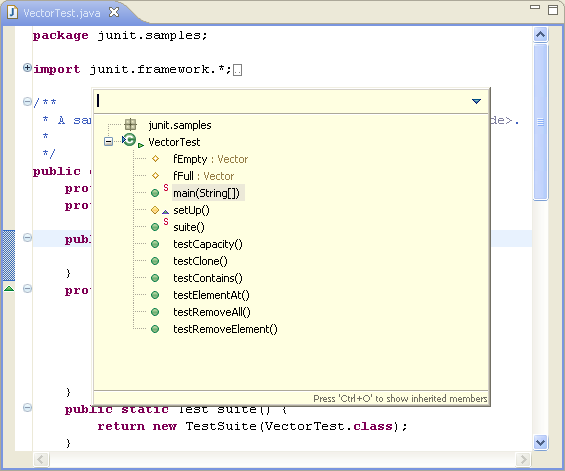 Further, use the arrow keys to navigate in the outline view and press Enter to reveal the selected element in the Java editor. Filter - Define filters so that not all members are shown in the quick outline. Sort - Sort the members by their defining type or alphabetically. Note: Ctrl+O always opens the outline for the current Java editor. Press Ctrl+F3 to open the quick outline for the currently selected type.